Stockholm-based fragrance house BYREDO have launched some fascinating parfums in recent times whilst working alongside world renowned perfumers such as Olivia Giacobetti (L'Artisan Perfumeur, Frederic Malle, Costes), Jerome Epinette (Jovoy Paris) and Michel Almairac (Chloé, Bond No9, Gucci). It could be said that their approach to perfumery is somehow very Scandinavian: understated, refined and with a distinct focus on craftsmanship and quality. 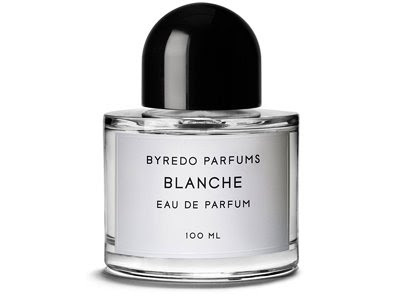 Now, as Byredo celebrate the launch of Blanche, their 8th skin scent, it is my pleasure to write these few words about this compelling release. Just as the name suggests, Blanche is a tribute to the colour white. Ben Gorham, the founder and creative director of the brand, notes the following: "the fragrance is pure and simple in structure but extreme in character"... and his perception is right on the money. The scent opens with diamond-white aldehydes that suggest a fragrance almost transparent in nature. Tender white roses blossom over a heart of hushed violet, dewy neroli and blushing peony... and whilst one can feel the translucent quality of this perfume, it is a scent which is really quite intricate. I immediately get the sensation of gauzy white linen billowing on a clothes line, still slightly damp from the wash. It is a sensation that I not only register via my sense of smell, but almost through touch... the composition is very tactile; soft and vapourous. Comme des Garcons might have taken some liberties when announcing the aroma of "washing drying on the line" in their 1998 head-space perfume offering Odeur 53, and perhaps the single-scent powerhouse Demeter may have taken a very literal approach when creating their perfume titled Laundromat; but Byredo's Blanche appears to have achieved this "fresh linen" approach with finesse and sensitivity. Light musk, blonde woods and fragrant sandalwood furnish the fragrance with a sense of depth, and lend a sense of familiarity and comfort. To my astonishment, I found that the fact this perfume is somehow diaphanous in nature, does not mean to say that it is in any way fleeting. Whilst sampling, I sprayed both a card and my skin with Blanche and I retained the scent for an entire day... the card was still perfumed after two. Quite possibly Byredo's best offering yet. This is the first in a series of City Shopping Features that Sorcery of Scent will be publishing. First stop: Copenhagen. As a chap living in Denmark, I'm often asked by visiting friends to make some recommendations as to where good quality fragrances can be bought in the capital. Whilst I myself live 170kms from the big smoke, I am only too pleased to direct them to some of my favourite haunts. Unfortunately though, few stores offer much more than the stock-standard mainstream range that can be found in any major city. This morning however, I visited Storm - a chic and stylish retail space that is fast earning the accolade of the best fashion and concept designer store in the capital. Storm's shelves and countertops are tastefully arranged with designer clothing from a variety of Scandinavian and international brands, high-fashion eyewear; magazines, CDs and art books, and a selection of eclectic foreign art films. 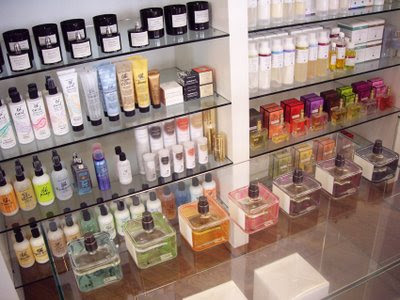 Most impressive (to the fragrance aficionado at least), was their excellent variety of niche perfumes and colognes. Mark Buxton Eau de Parfums (author of fragrances for Givenchy, Versace, Cartier, Comme des Garcons et al). Byredo Parfums - Eau de Parfums, room sprays and votive scented candles. Costume National Eau de Parfums. Christian Dior Exclusives Eau Noire and Bois d'Argent colognes and scented candles. Diptyque perfumed products including their EDT range, cologne trio and candle/room spray range. Six Scents Series One - individually numbered bottles in a limited series of 2000. Perhaps more impressive than the scents themselves, is the non-pretentious environment they are housed in. Storm Design Art Fashion is a boutique situated on a corner just meters from a busy Copenhagen street, however when one steps in from outside through the heavy glass doors, you can't help but feel a relaxed and welcoming shopping experience awaits. Soothing ambient music plays through concealed speakers and staff are warm, friendly and accommodating - something very atypical of service in Scandinavia. If you are fortunate, as I was, you might meet store owner Rasmus Storm who was only too happy to walk me through their range. You can get a sense of his impeccable taste and editing eye, which is apparent in the product selection and artfully decorated interior. Storm is without doubt the premiere destination for anyone visiting Copenhagen who wishes to explore a contemporary retail environment brimming with sophisticated fashion, á la mode art and design literature, and hand-picked perfumes.